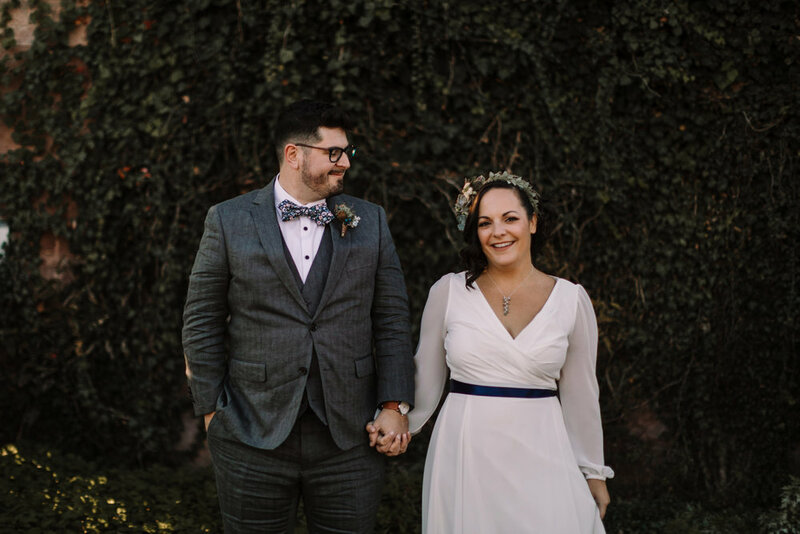 Cool and Earthy Fall Palette for Maggie + Dan's Rocklands Farm Wedding — Sungold Flower Co.
We first met with Maggie and Dan back in December of 2017, practically a year before their wedding date. After only a few minutes of chatting, we could tell that this celebration was going to be a good one. Both Maggie and Dan are incredibly detail oriented and design-minded, and perhaps most importantly, thoughtful. They wanted to ensure that each element genuinely reflected them and their story, which is a process that we are always so proud to be a part of. 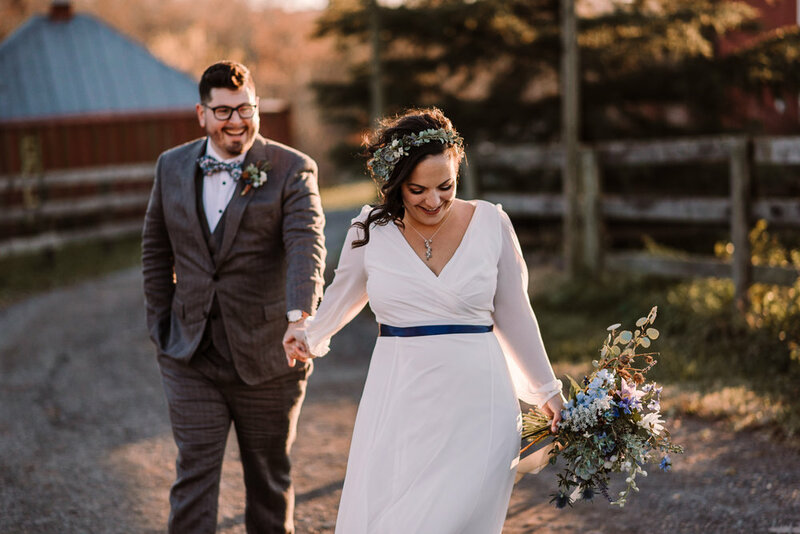 In our meeting and through the e-mails and conversations that followed, we came up with a plan to include as much locally-grown flowers and foliage as possible, even though the wedding was set for mid-November (likely post-frost here in the DC area). 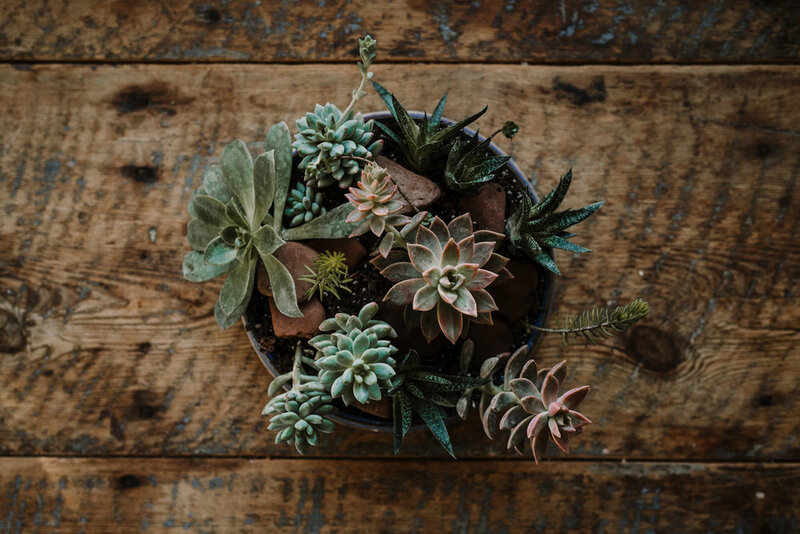 The main color palette was dusty grey-blue, muted greens, brighter blues, turquoise, navy, and white with succulents, seed pods, and lots of texture. They wanted an earthy, wild, enchanting and organic vibe, authentic to time and place. Each of the 15 centerpiece vessels were hand-thrown, stamped, glazed and fired by Dan, and we spent a sunny afternoon outside the workshop planting them with succulents and aloe sourced from Thanksgiving Farm just up the road. We took a few minutes to walk down to the creek and grab some Seneca sandstone rocks to add. We couldn’t have been more pleased with the final product. 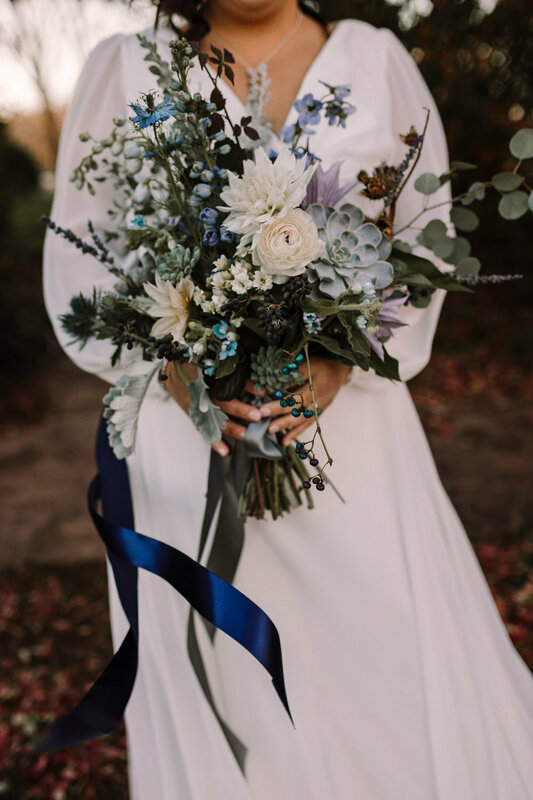 Maggie’s bouquet was so fun to put together, using eucalyptus from M and M Plants in Comus, MD, foraged seed pods, grasses, porcelain berry, and privet as well as our own dusty miller, herbs, clematis, dried lavender, raspberry greens, and the very last of the dahlias from the hoop house. And of course, succulents. The eryngium, nigella, delphinium, acacia, and ranunculus came from our wholesaler. About 5 weeks before their wedding date, I posted a photo on our IG of porcelain berries, one of our favorite things to forage at the end of the summer and Maggie commented on the photo saying how much she loved them and that if they were available in November, she would love to include them. I told her we’d try our best, although at the time I felt skeptical they’d still be around. Somehow, though, I managed to find a patch of the vine (at the end of a lane I never drive down) that was still going strong the week of their wedding. We cut it, we used it, and that Saturday night the temp dropped so low that it all died. We hope that every fall, when Maggie and Dan get ready to celebrate their anniversary, they will notice the porcelain berries scattered down the highway, along the roadsides, and under railway bridges. A perennial reminder of the immense natural beauty of their special day. Wanna be flower friends? Sign up to stay in the loop about upcoming events, workshops, collaborations, and farm news. We promise to respect your privacy.